We love it when customers send us pictures! 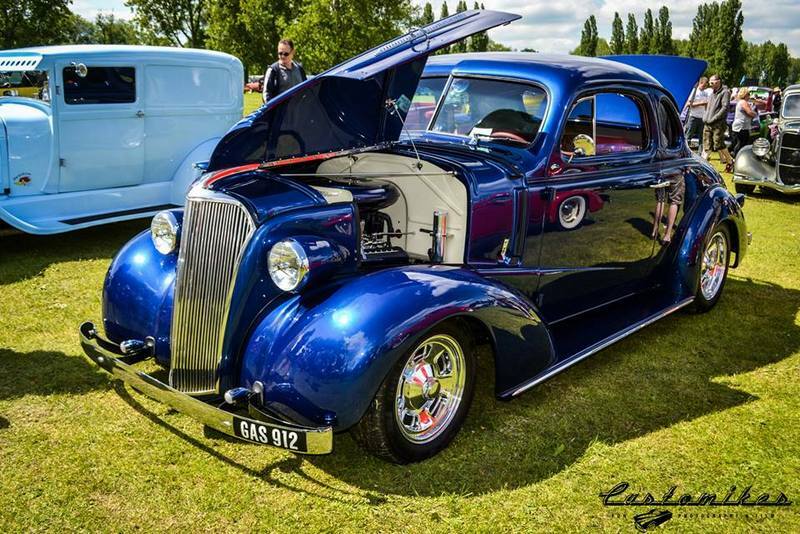 Check out some of the amazing cars that are running a Dual Flow PCV valve, along with some of the stories from our customers about how it has helped their tuning problems. I’m using a Wagner PCV valve in PML valve covers. Good tight fit with no special modifications. Had continual rough idle issues, the change over to this valve totally eliminated that. 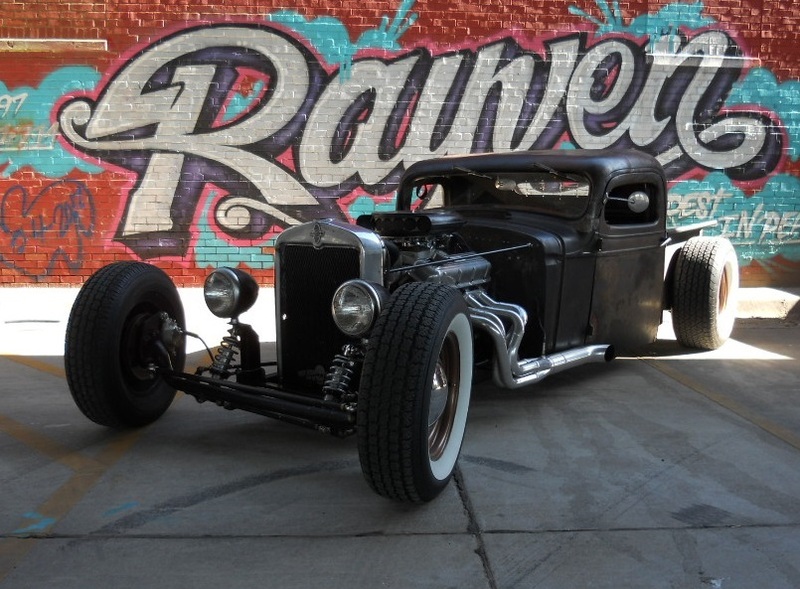 As I promised to Gene, we are having much more fun driving our street rod since installing the Wagner adjustable PCV valve! Gone is the “stumble” we had during acceleration, especially from idle! 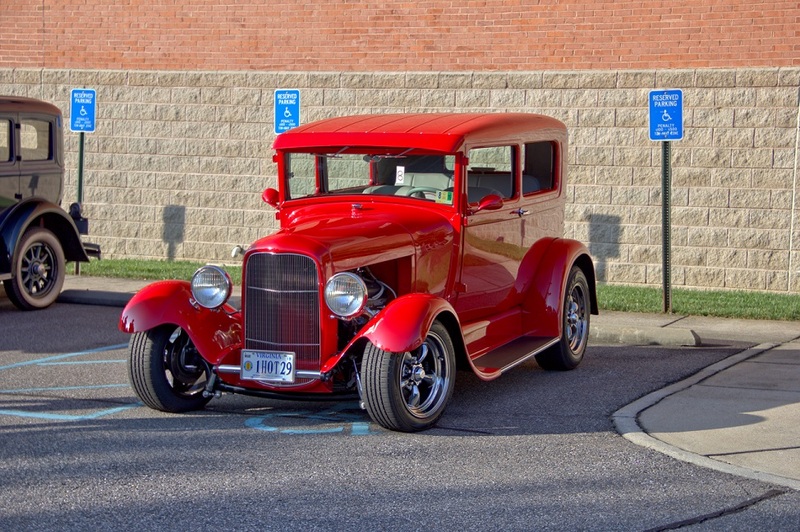 Our ZZ4 crate motor now performs like we expected…and since we have owned our 1929 Model A for 41 years, we sure do notice the difference! 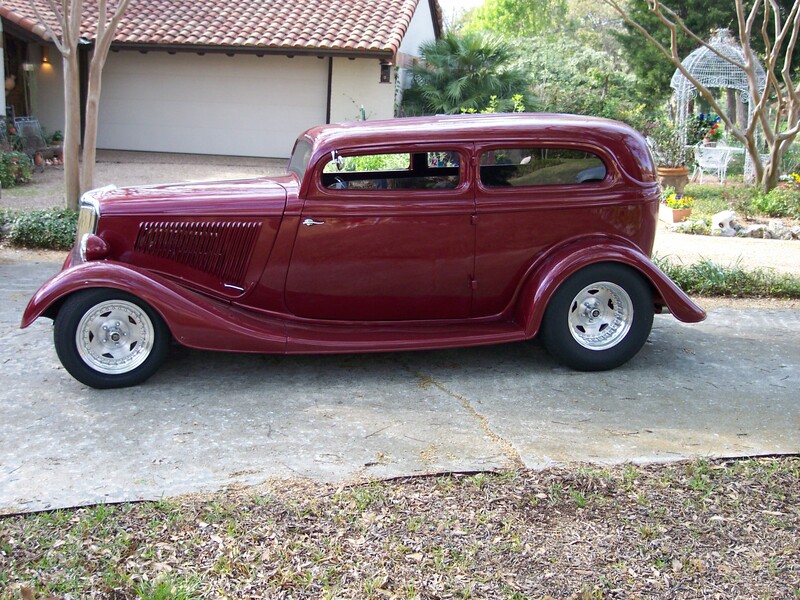 The wife also noted that the faint smell of gasoline we had gotten used to in the garage, has now left the premises. I had been trying to chase down a small oil leak prior to the addition of the Wagner valve, and that too, is gone. Gene, want to thank you for all of your help. When I first saw your ad in the Good Guys Magazine, I was skeptical that a PCV Valve could be the cause of so many problems. 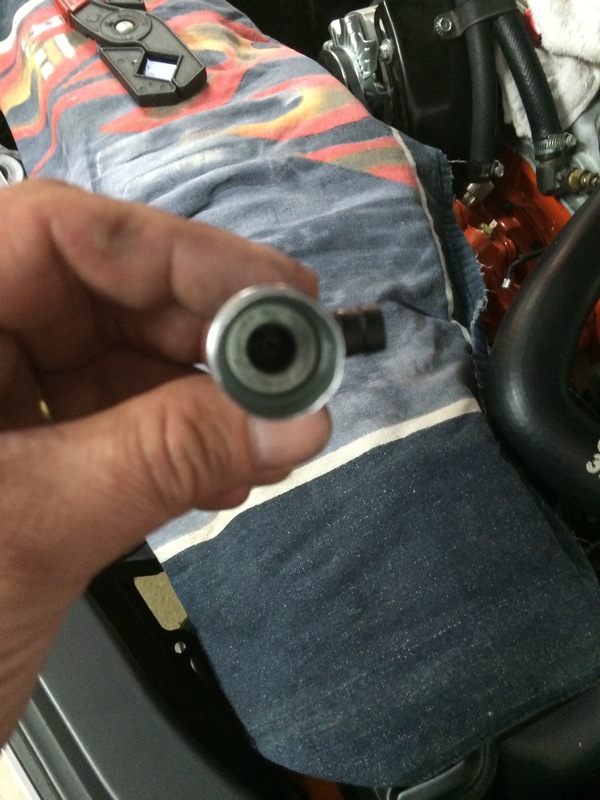 I was experiencing several of the same issues and never suspected the PCV Valve. If you remember when I called, I had several questions, which you answered with solid explanations. I took a chance and purchased the valve. I’m glad I did. First let me tell you about my car and then about the problems your valve fixed. 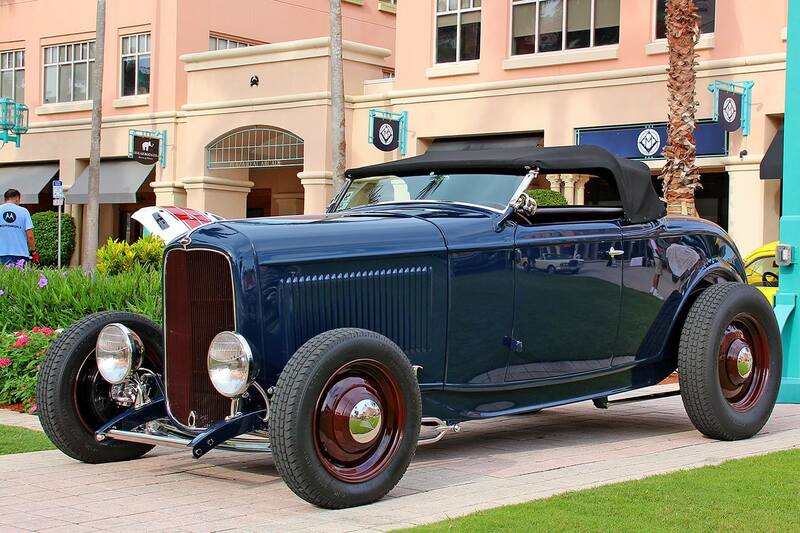 My car is a 1934 Chevy Phaeton, and with a lot of help from friends in my car club, we completed a 3½ year build, from the ground up. 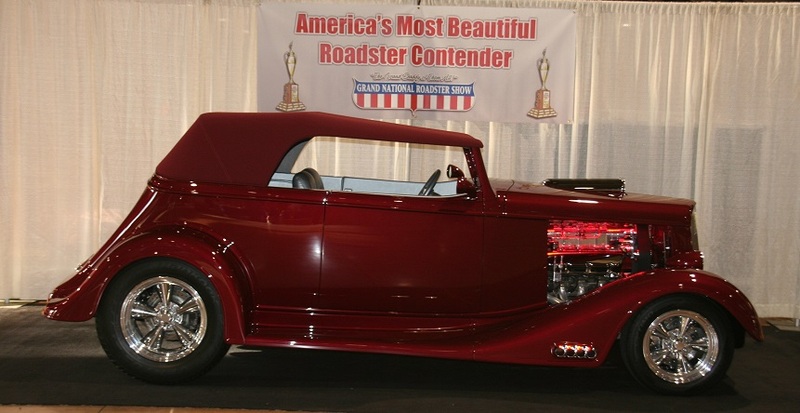 It has won numerous Best of Shows and was one of the top ten cars in the country, invited to the Grand Nationals AMBR (Americas most beautiful roadster) Show in Pomona CA, where in 2014, it won for Best Paint. Now about the engine. People have said it looks like a piece of jewelry. It was designed to be a full-blown show quality engine. 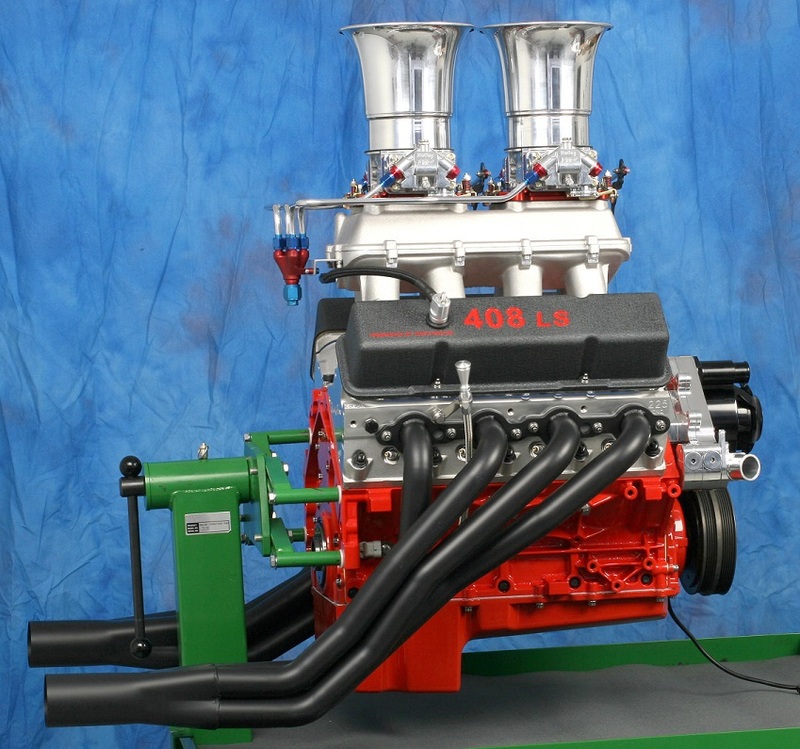 It’s a 454 GM big block specifically built, with low compression 7.5:1 at idle with a 671 blower, and twin 750 cfm Holly Carbs. It was dyno’d @ 700HP and 665 ft. lbs. of torque, and at 3100 RPMs my compression jumps to 14:1. The engine has a long lope at idle and my vacuum reads from 10 to 15 inches on each four turns of the crank. Because of this, I had to set up the dual flow valve with a fixed Orifice Mode. 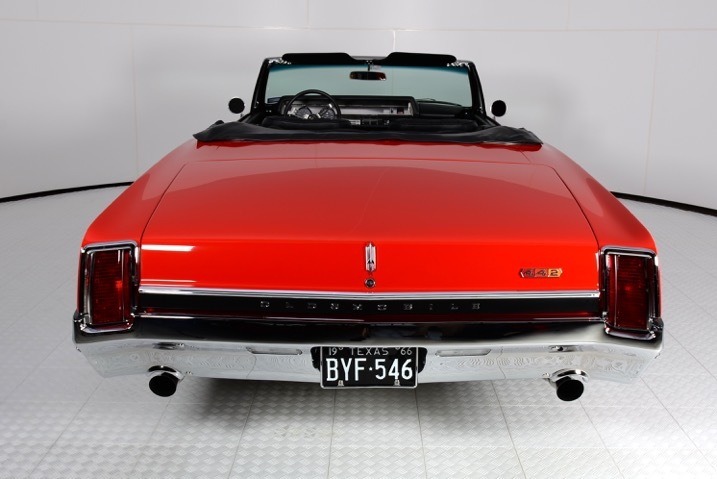 My problems were mainly oil leaks, not always in the same place, breather cap blow by, erratic and hard to adjust idles, dirty oil and moisture issues. 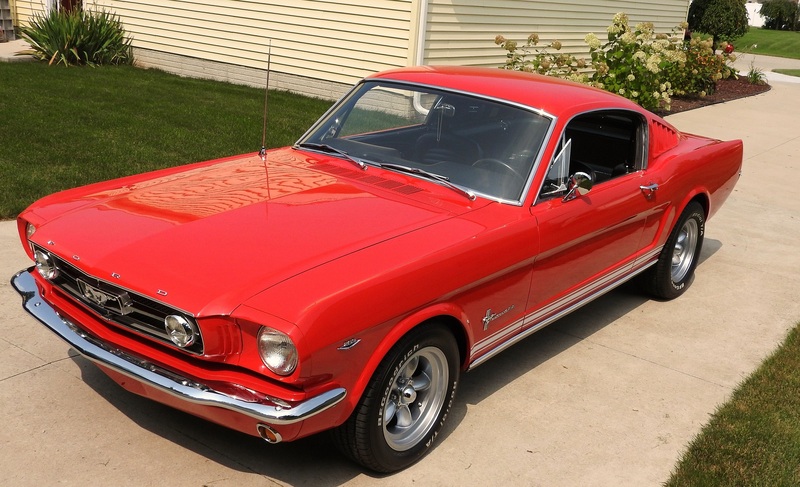 The first improvement I saw immediately was the engine idle was smoother and easier to adjust. My oil always looked like it needed changing after 100 miles. I have 300 miles on the new valve and the oil still looks new. I don’t see any evidence of moisture around the bottom of the PCV Valve and so far, no oil leaks are present. Some tips on the installation. I purchased the Morosso oil separator, M/O 85474, with the bottom drain valve, which makes draining very easy. I installed a tee in the piping where I can connect a vacuum gauge, and I machine polished every part that went into this install. 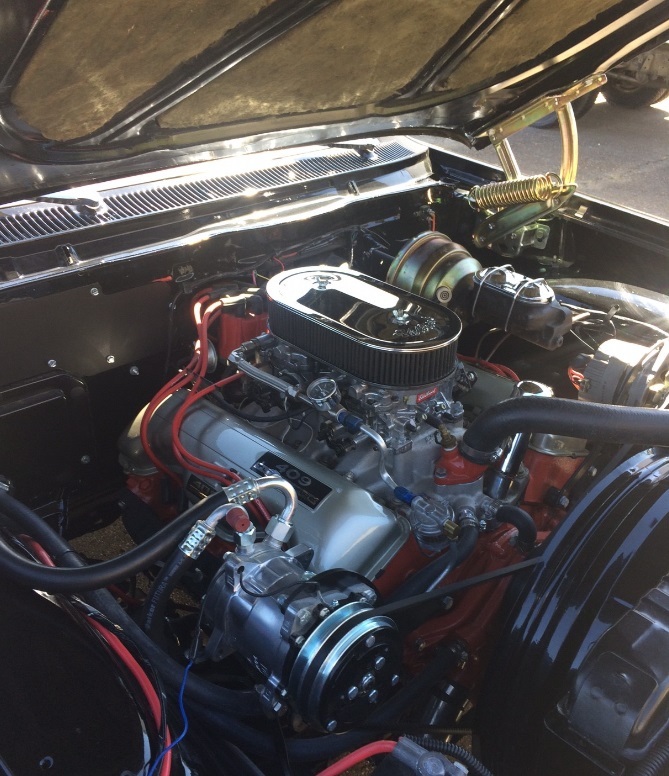 My car is a 1966 Chrysler 300, engine is a 512 ci stroker with Indy heads and intake, Pro System custom carb, 10,6:1 compression, custom Comp roller cam, Harland Sharp rockers, Smith Bros pushrods, custom aluminum Charlie Gilbertson pan, MSD ignition, TTI headers and exhaust. 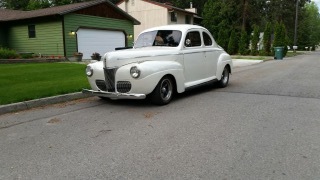 It had some oil leaks, smell and the idle was a bit rough and difficult to tune. I changed the rear main seal two times, installed a billet retainer, tried various timing/carb combinations but without success. 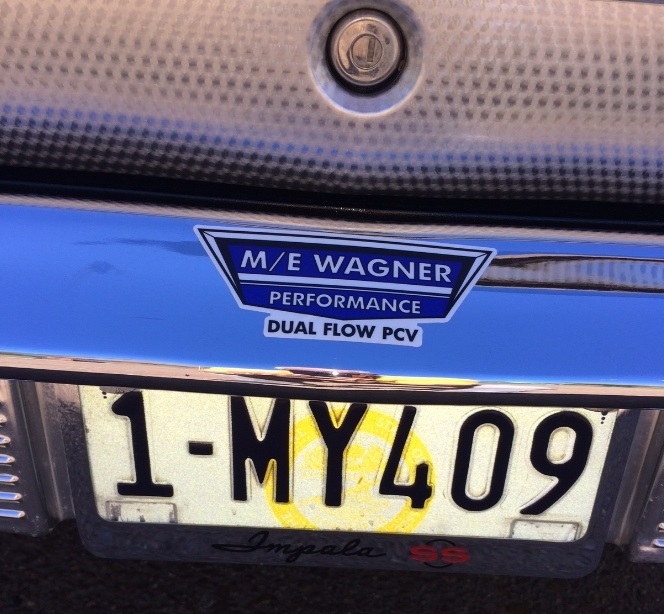 With the M/E Wagner PCV valve the problems are finally solved and the car idles incredibly smooth at 700 RPM. Thanks for developing such a jewel. I’m thrilled to report your adjustable PCV valve has solved the issues in my engine just as you predicted. 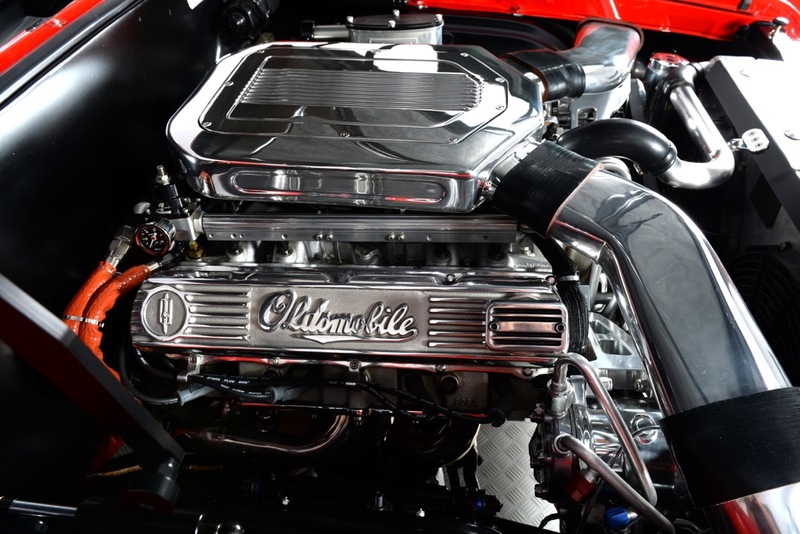 There’s no more oil pushing up through the manifold bolts or seeping past the valve cover gaskets as was the case prior to installing your patented & almost magical device. 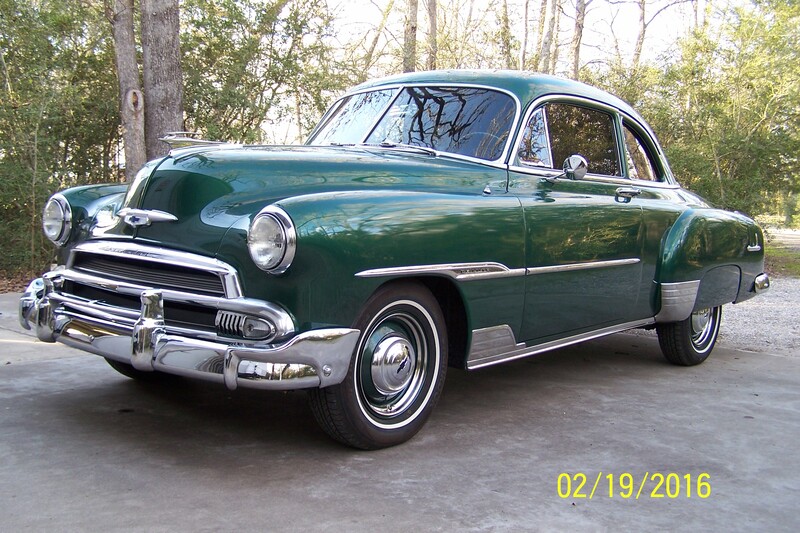 After seeking help from the engine builder, local mechanics and several hot-rodding friends of mine…no one could help me identify why oil was pushing out even when there was no visible evidence of positive crankcase pressure. 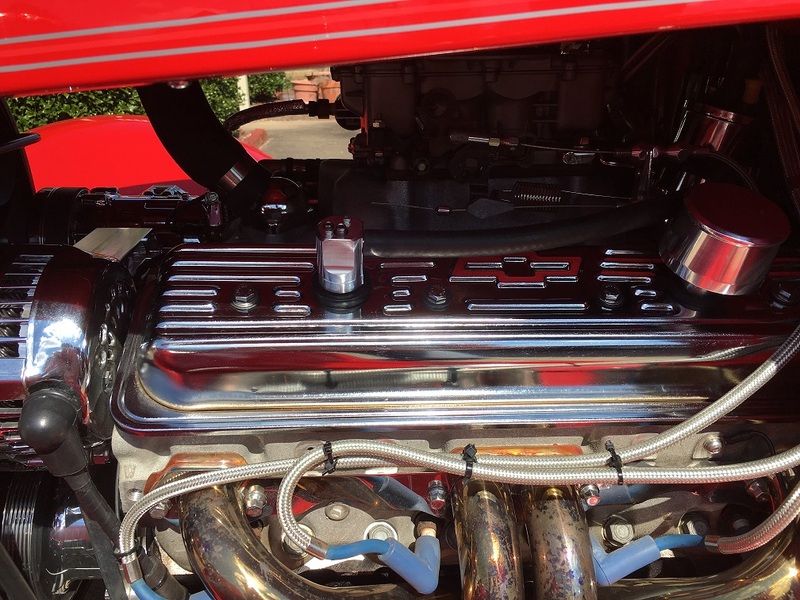 The installation and adjustment process were as easy as your videos showed, and I became a true believer after attending the local car show this weekend. Before I installed this device, I would have to clean the oil off the engine after only driving a couple of miles. After installing your dual flow valve last week, I drove 100 miles this weekend with zero oil residue. I can’t thank you enough for taking the time to explain what was causing my problems, offering a money-back guarantee and following up after the install. If anyone needs proof your product really works, just have them call me for a testimonial. 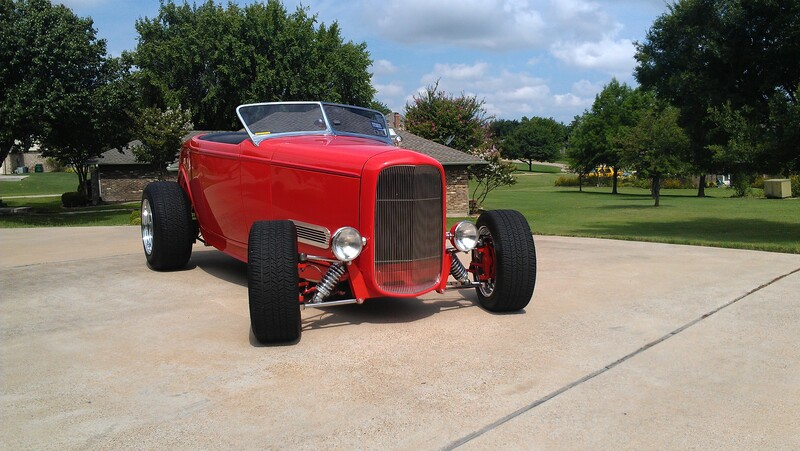 I can finally enjoy driving my old hot rod again! Thank you! leaking front main crankshaft seal, replaced at 300 miles. rough idle and stumbling acceleration from stop (could not be tuned out with EFI). oil leak from back of block, assumed to be rear main seal began after replacement of front seal. constant burned oil smell in the garage, even after car sat unused for weeks. rear oil plug below distributor and to left of cam seal blew out at 850 miles, spraying oil all over the bottom of the car. oil plug replaced and confirmed that rear main seal was dry. oil sprayed back out of breather cap on to the firewall, last source of oil. 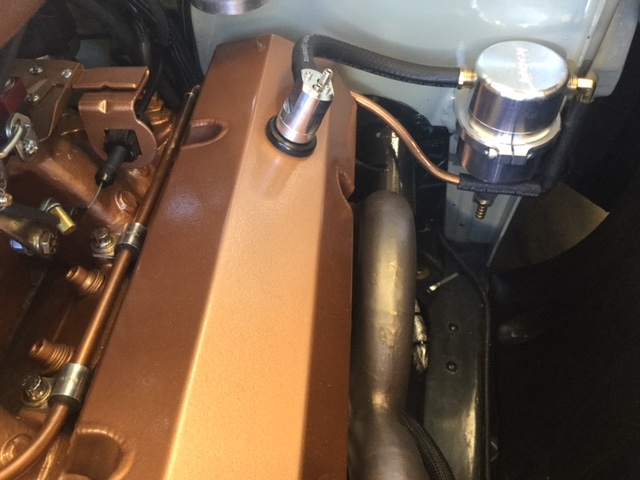 No more oil leaks anywhere or oil spray from the breather cap. Engine now idles smoothly, whether cold or warm after driving. Hesitation is 90% eliminated after 25 miles and seems to improve with EFI learning. 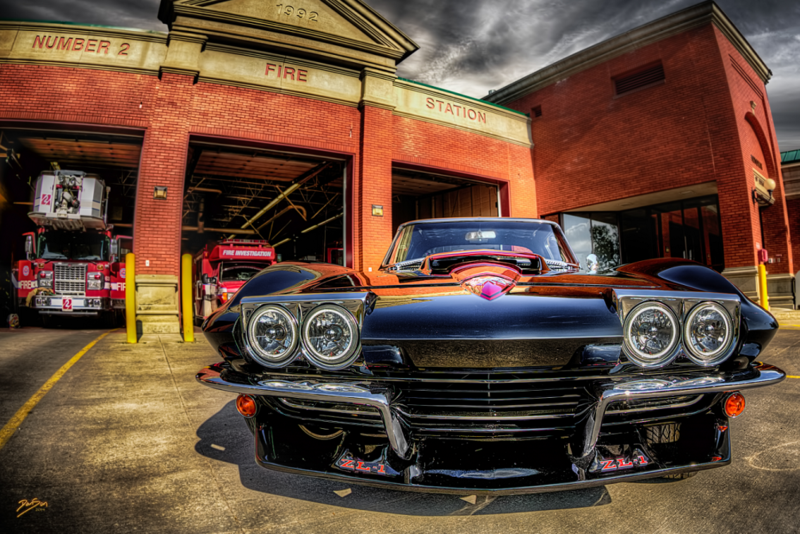 No more burned oil smell around the car or in the garage. I wish I had discovered the DF-17 a year ago and would highly recommend it to anyone with similar issues. 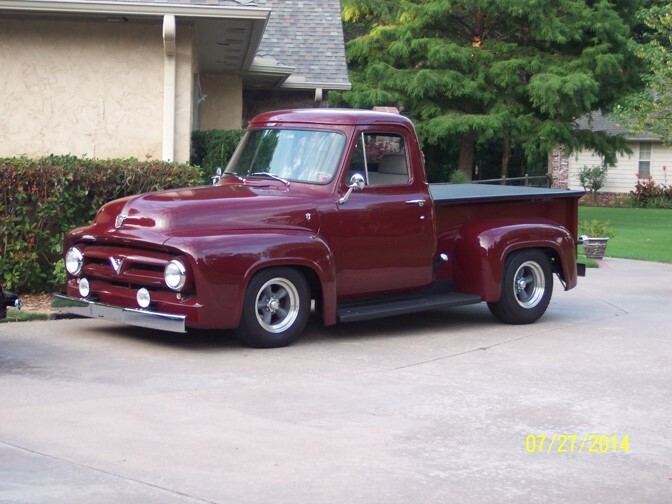 After the great improvement your product made in my 40 Ford coupe with a TPI 350 Chevy motor today I ordered two more units, one each for my 53F100 with HO 302 Ford and my 55 Sunliner with a 300 HP 302 Ford. 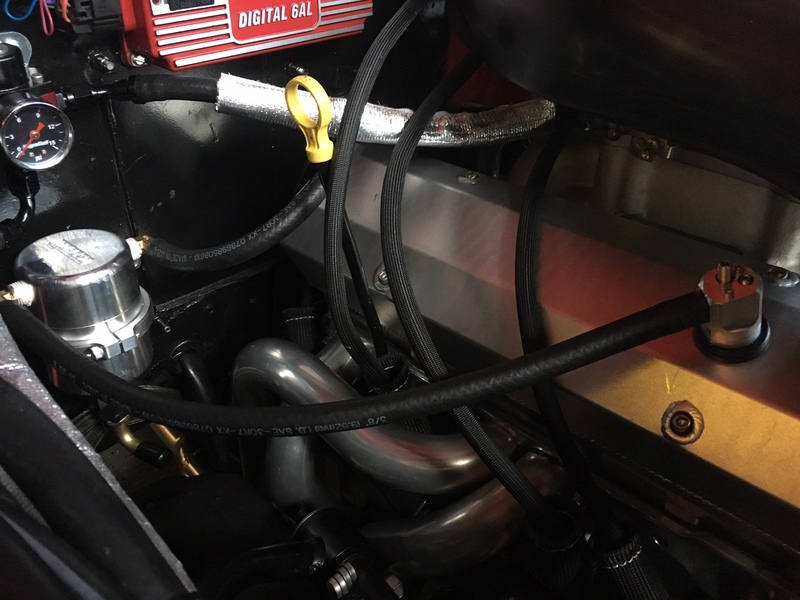 Installing your PCV on the 40 completely eliminated the oil seepage from the breather and PCV grommets and also eliminated an oil leak from the rear of the intake. Also it all but eliminated the sometime warm start stumble. Thanks for a great product. 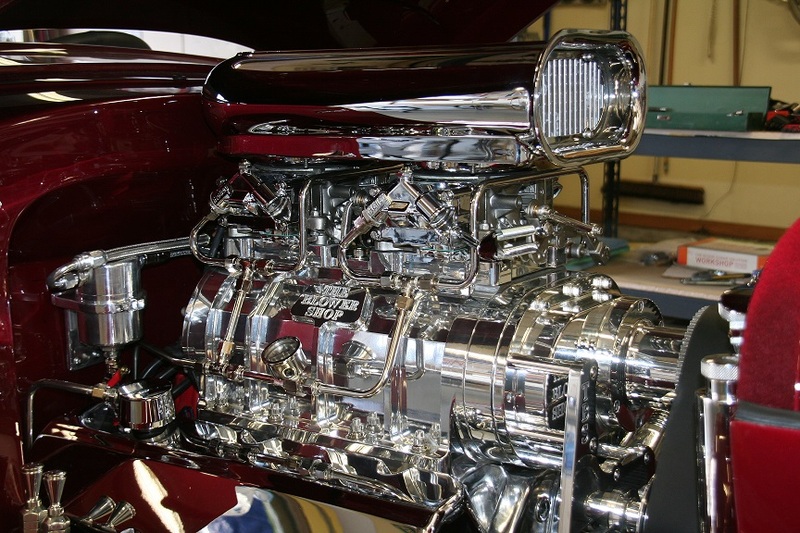 Renowned technical writer Mike Mavrigian (editor of Precision Engine Magazine) sent us pictures of this 408 cubic inch LS engine built in his shop, Birchwood Automotive. 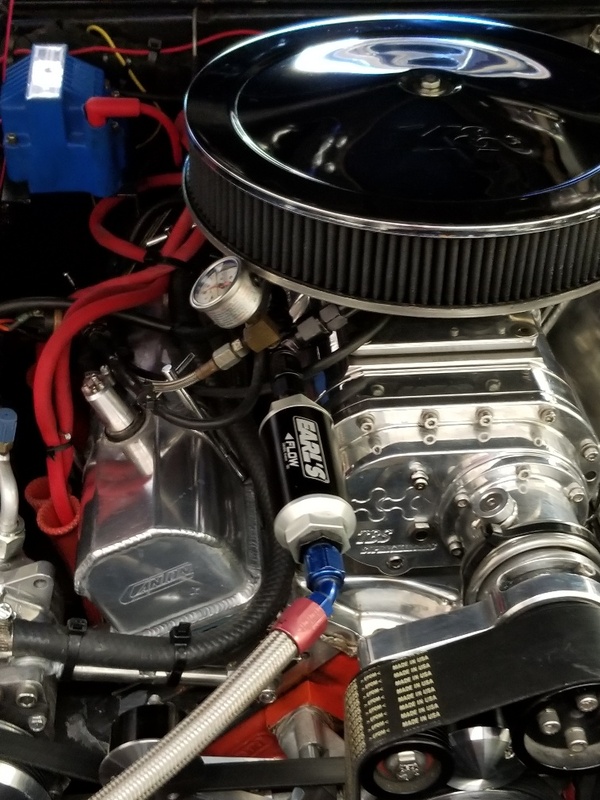 It is topped with dual Holley 660 CFM carbs and uses adaptors that allow small block Chevy valve covers to be mounted to the LS heads. 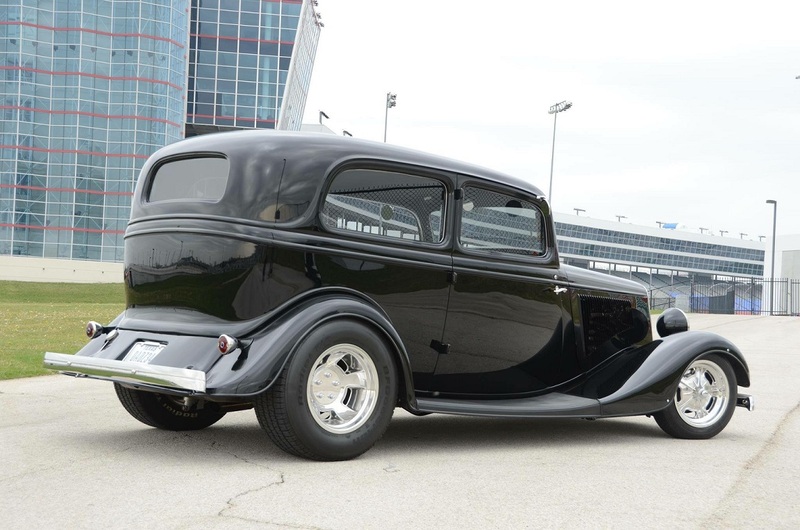 It pulled 670 HP and 581 lb-ft of torque and uses a DF-17 Dual Flow PCV valve. I finally got around to installing the PCV valve yesterday, I had no trouble at all adjusting the idle & cruise and the vacuum gauge did just what your video said it would. I noticed the idle cleaned up right away. 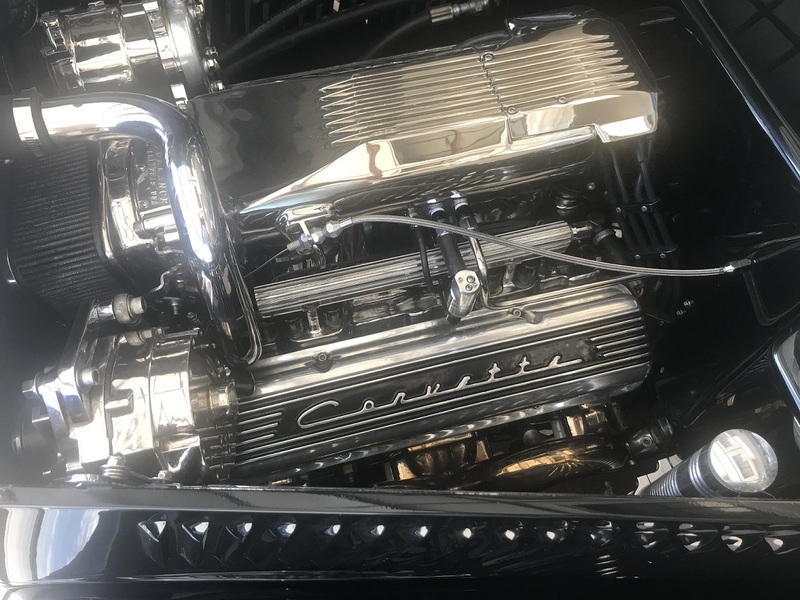 I wanted to write you and tell you how pleased I am with your valve, it made a huge difference on my supercharged Camaro. It actually lowered my AFR 1 whole point and totally got rid of my pesky valve cover leak. I live in Memphis, TN. 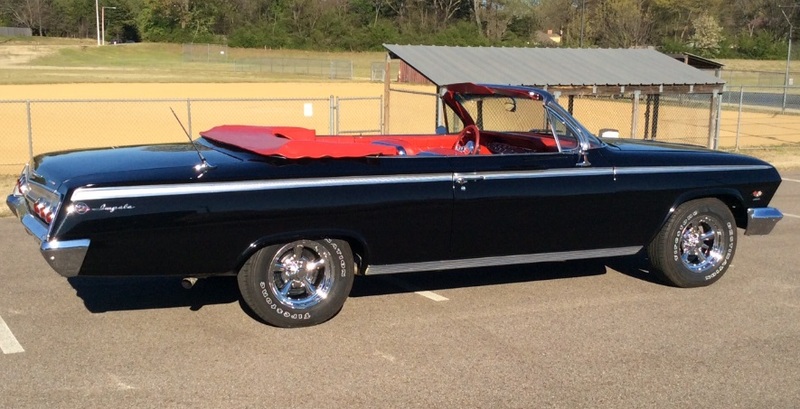 I purchased a 1962 Impala 409/425 SS 4 speed convertible. 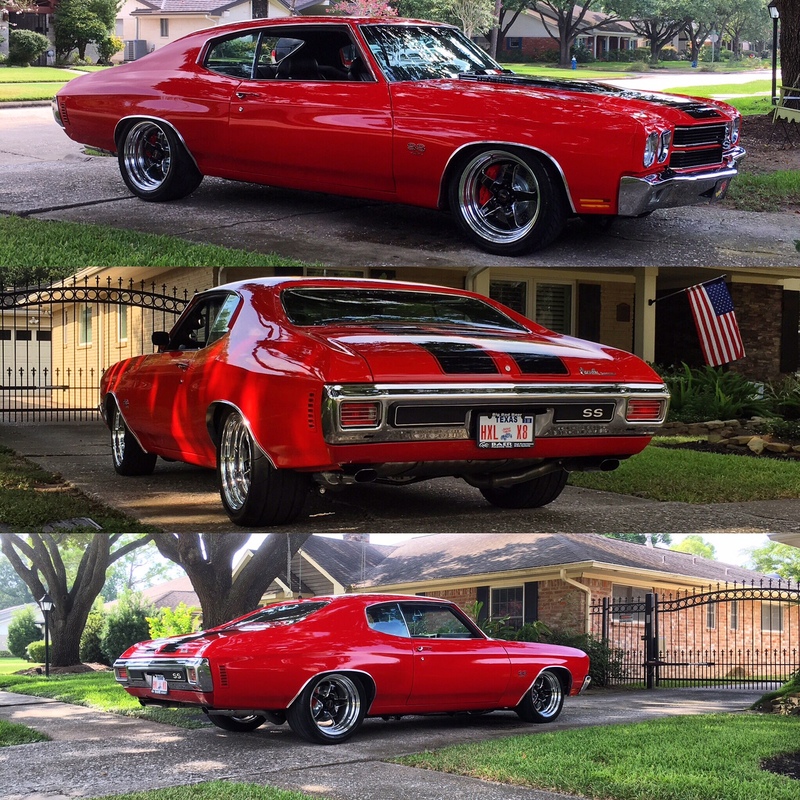 My mechanic and I completed a frame off restoration. 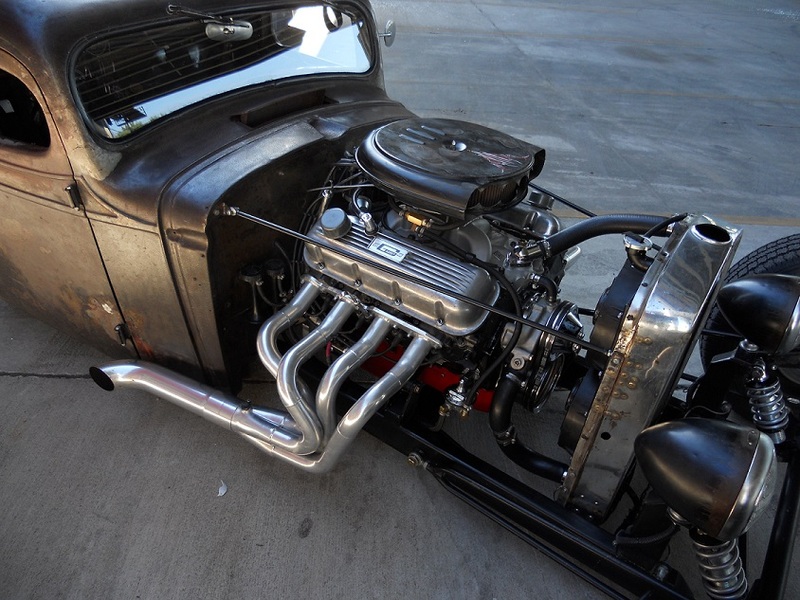 We rebuilt the engine and put a 4″ stroker kit with a Comp Cams 556 lift hydraulic roller, 10.5 to 1, 690 heads. The engine is 481 cu. in. 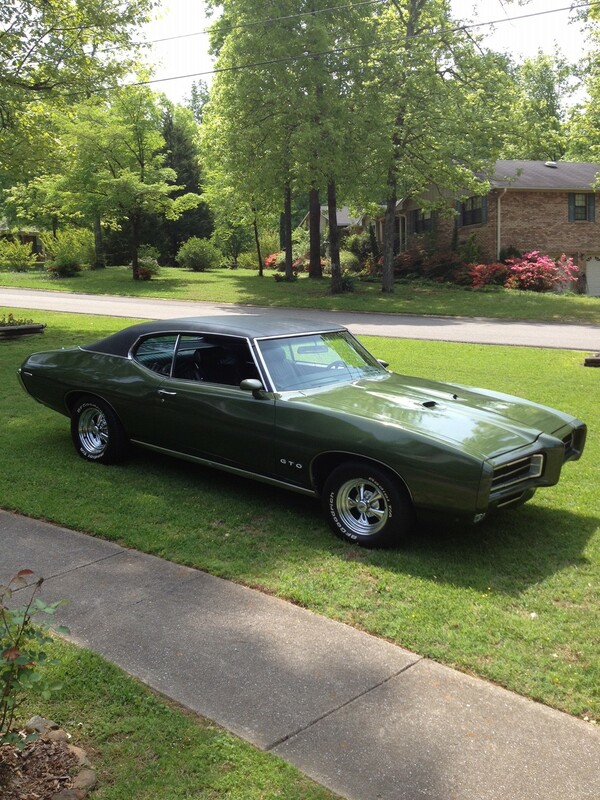 And makes 550 HP. 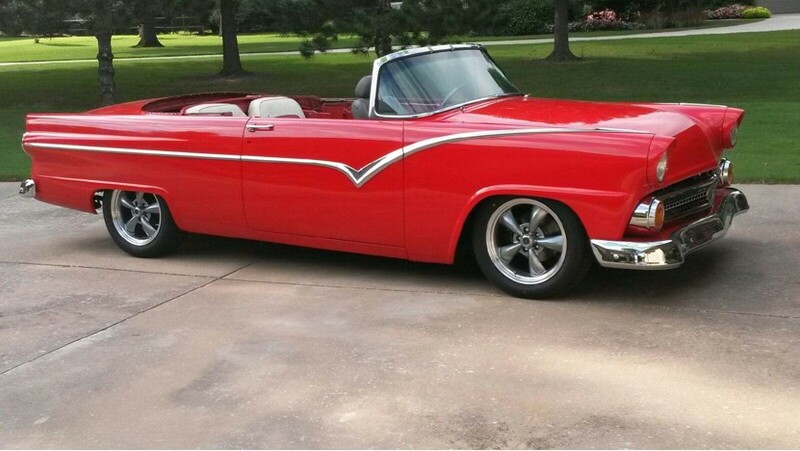 A really nice dependable street engine and drop dead gorgeous and beautiful classic ride. My problem started when I began driving on the weekends. The engine didn’t smoke at all and ran perfect. I put about 300 miles on the engine and checked the oil one afternoon. It was 2 quarts low. I checked for oil leakage and found a small spot of oil in my garage. Nothing big. A spot or two about the size of a quarter. 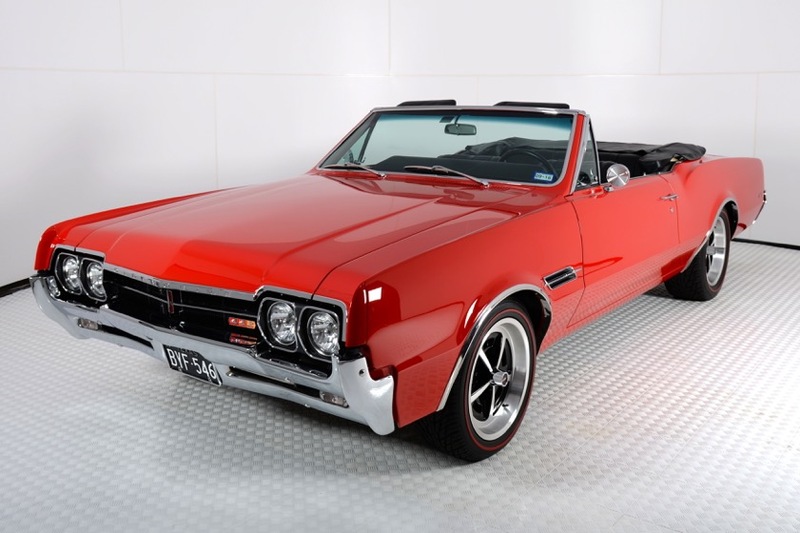 So drove the car again and payed special attention looking for smoke from the exhaust. None. So I pulled the plugs looking oil on the plugs. None. We were about to pull the engine down when I found your website and read your article on your dual flow PCV. I had my mechanic read your article and he agreed it was worth trying before he pulled the engine. I ordered your dual flow pcv and to make a long story short I now have zero oil consumption. Amazing product and moderately priced. Fantastic product. 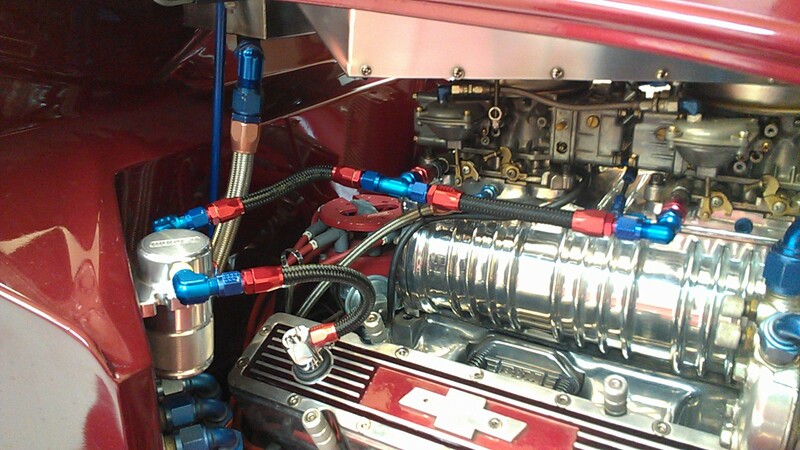 The Wagner PCV valve gave my small block Chevrolet engine way more tune-ability and my power brakes work better too! 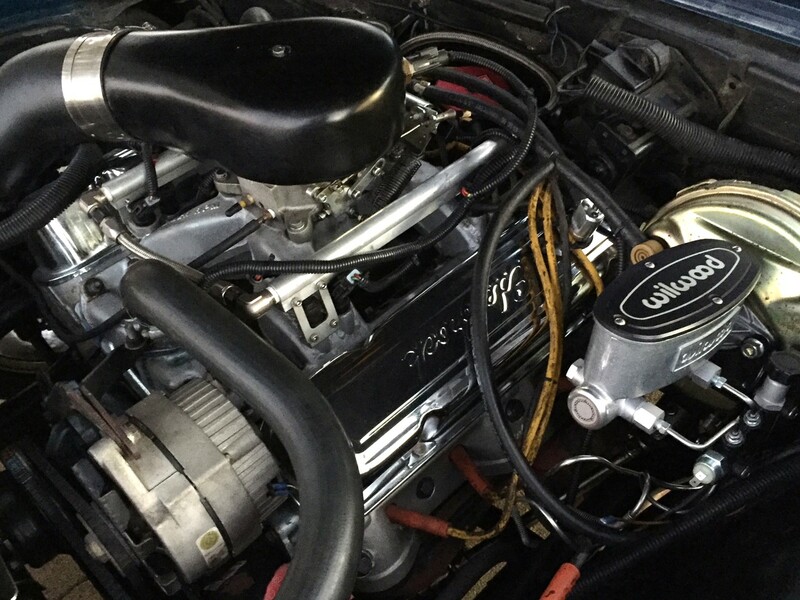 My small block Chevy engine started out with 12.5 hg of vacuum at the carburetor and ended up with 14 hg with the Wagner valve. 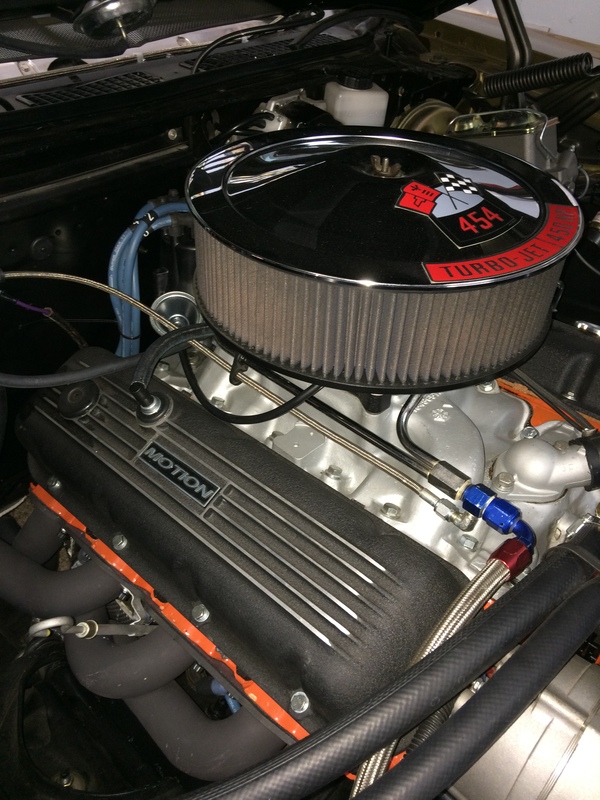 Although it seemed expensive, I have been very happy with the increase of tune-ability of my Dart block 500hp small block Chevy. A side benefit is that my power brakes work way better due to increased engine vacuum. 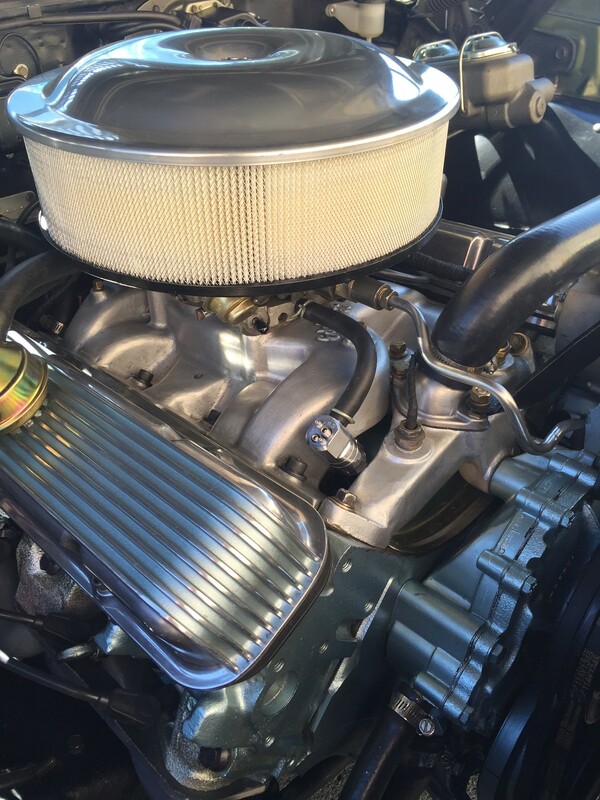 Engine leaks and the driver smelling like 30w oil are a thing of the past. As a guy who has changed out the same gasket multiple times, I can tell you that engine leaks are quite often not a gasket problem but rather a crankcase pressure problem. 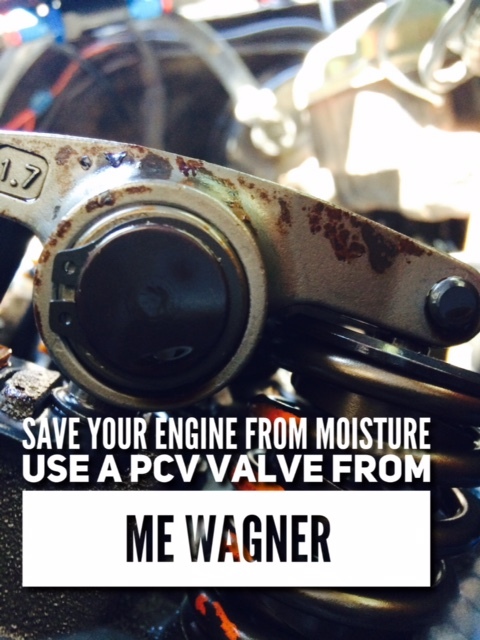 The Wagner valve fixes the problem, not just the symptoms. 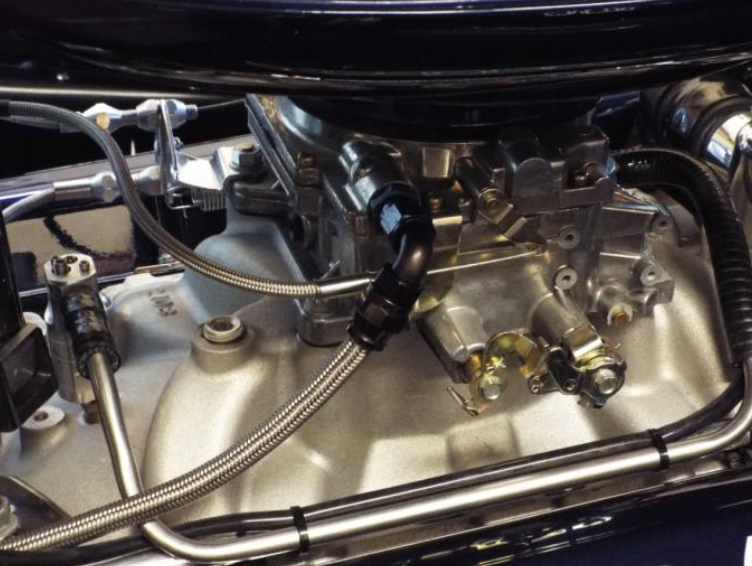 The Wagner valve finally gives users a way to fine tune a PCV system for performance and drivability with the added benefit of less engine leaks. Thanks for a great product. 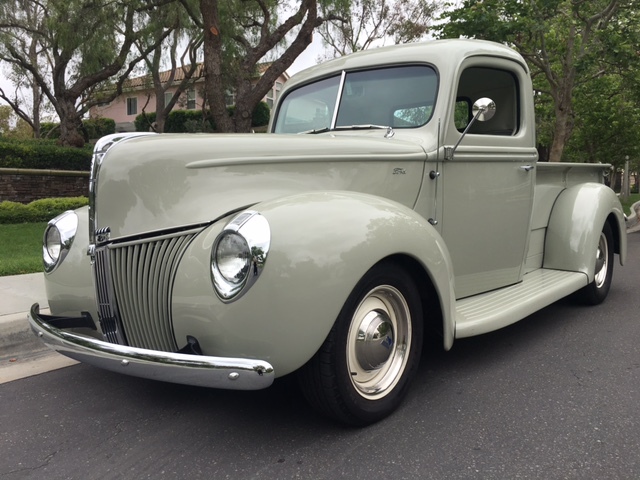 I fooled around with a $450 electric vacuum pump and tank on my 1940 Ford pickup without success! Thank You so much for your help on Friday. I did indeed receive the PCV valve on Saturday morning and was able to install it on my car. What a beautiful product!!! In looks and function. I was able to tuck it away to maintain the “Day 2” look of my car. It did exactly what you said it would! I can tune my carb and the oil smell is gone. I drove the car about 45 miles on Saturday. 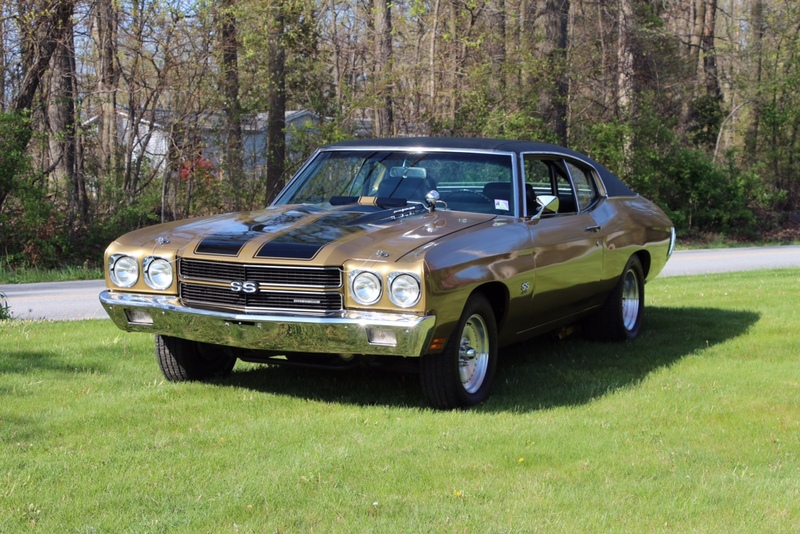 I will be ordering another one for my son’s Chevelle in a few weeks. 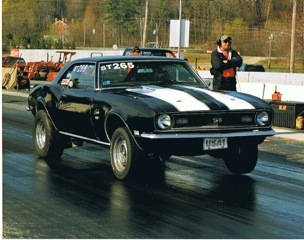 I have forwarded the link to your website to my engine builder and several car friends of mine. Thanks again for your commitment to getting it right! 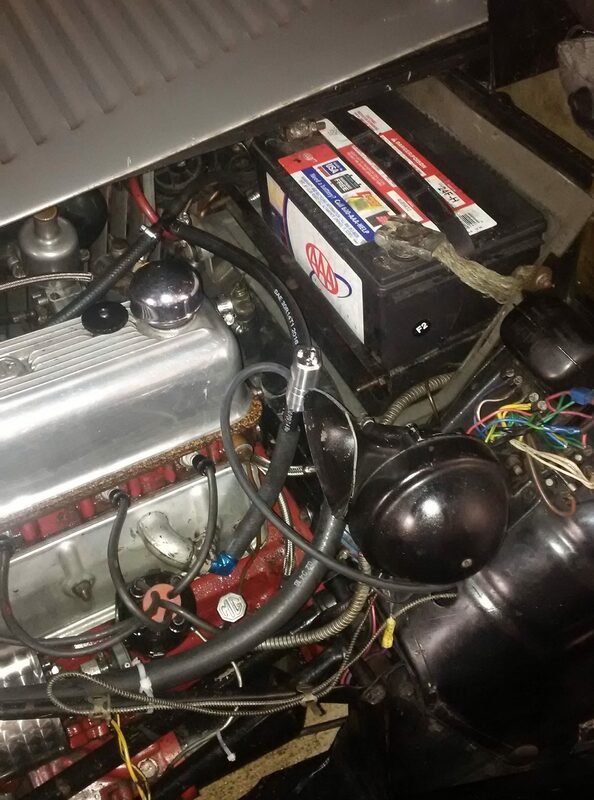 Note how Jim “gutted” a stock PCV valve to use as an adaptor to his valve cover. 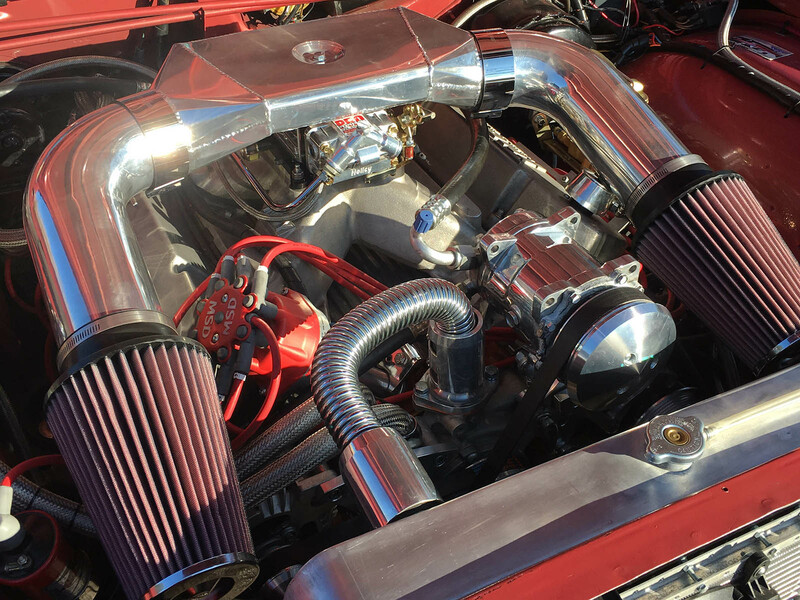 He hid his Dual Flow PCV with inline adaptor under the air cleaner for a stock look. Thanks for a quality, made in America product. Your PCV has made a noticeable difference in idle tuning and all round driving situations. Customer service was extremely good and shipping was fast. I recommend this product. Thank you. Fired my decidedly expensive rebuilt engine with the new valve, I was delighted to encounter absolutely no tuning issues with the valve. 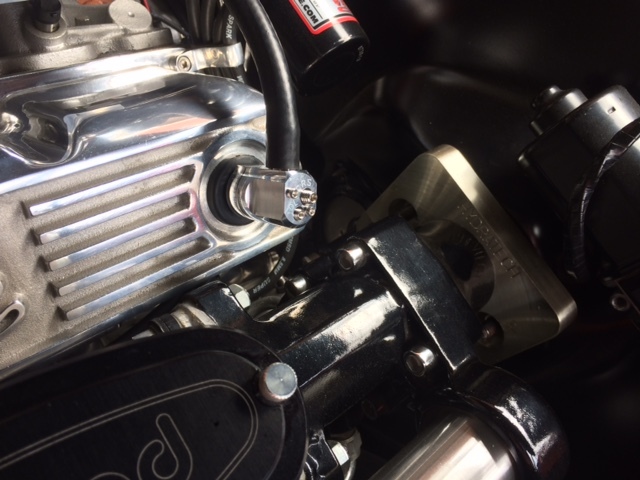 I was glad to discover superior ventilation in my crankcase- your design is amazing. All that’s left is to brag and show off the valve. For your enjoyment I made an ad out of my old motor for your benefit. I hope you’re around for years to come, but in the mean time enjoy a snap shot of what happened when I created my own valve. That’s really my engine, that’s real rust, and it happened because ventilation was poor for too long. Glad it won’t happen again! Just thought I’d drop you folks a line and let you know I’m very happy with the dual flow PCV valve. It does what you said it would and that is regulate flow of crankcase blow-by. How do I know it works. Well first of there is no oil sneaking by any gaskets. 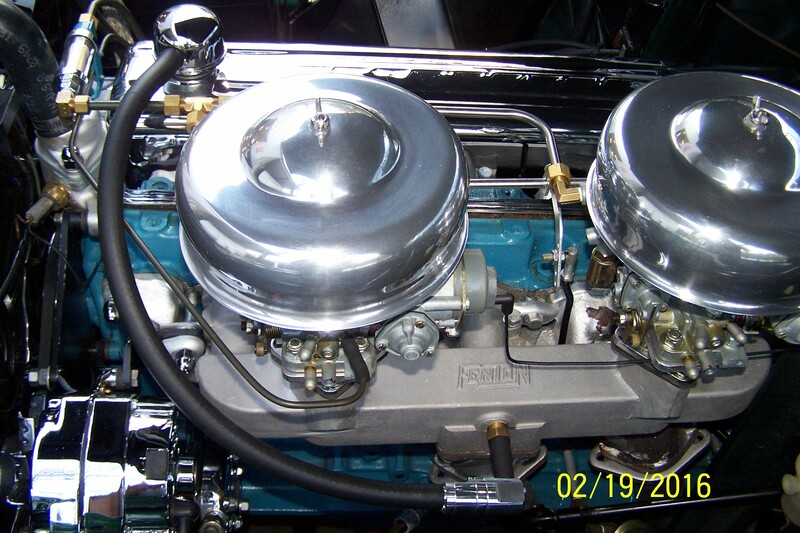 No weeping or seeping oil along valve covers. Everything is dry and I haven’t seen that since the engine was built. The guys that built the engine for me said it wouldn’t leak. The leaks were caused by an ineffective PCV valve. I tried a couple of different ones with varying pressures – although one was better than the other I still had oil seeping from gaskets but not as great. Once I installed and set-up the new Wagner PCV all was good after. It’s been 3 weeks and not a drop of oil anywhere. Also, I believe the dual flow really works well and does what it says it’s suppose to do. I don’t have a run of the mill engine. 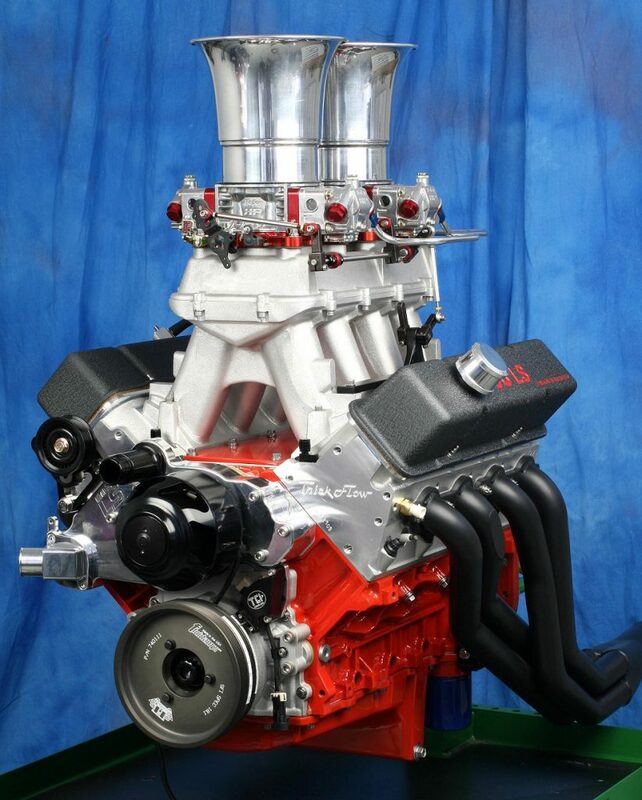 It’s a new GM 427 aluminum ZL-1 engine stroked to 496 cubes and pushing about 600 hp. It has a big solid roller Comp cam yet pulls about 10 inches of vacuum. The dual flow was a little pricey but in the end it was worth it. Plus, it just needs to be maintained and that’s pretty straight forward. Thought I would drop you another line about the dual flow PCV valve I purchased a few months ago. The other day I changed my oil and as I was crawling underneath my car I was looking for all the old oil leaks coming from the usual locations. Was gladly surprised to not to see one spot that had any oil on it. Even the oil filter which usually drops a couple of drops of oil had zero. In fact there was no oil anywhere. I’m very happy with your product. Thanks again. I would like to tell you how happy I am with your PCV, I had oil coming out of my breather and was always cleaning my valve covers. Also oil was dripping from the bottom of the bell housing, I think it was the rear main. Being a 1965 Ford 289 it had some years on it and 40,000 miles, but it had some blow by. After installing you PCV and setting it I have had no oil on my covers . Needless to say I’m very happy. 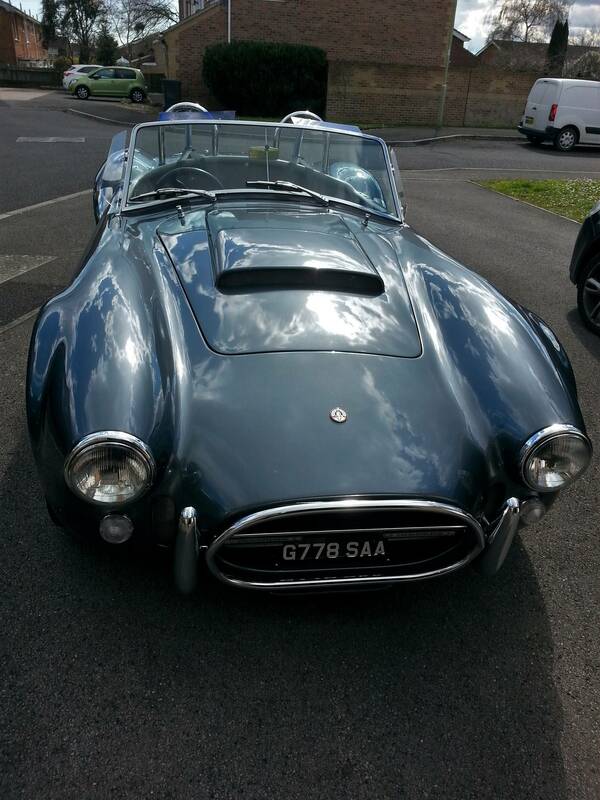 Just a note to say thanks for the valuable advice – all fitted & looking good! Got hit by import taxes and handling fees…but it’s still worth it as it’s a beautifully engineered bit of kit. 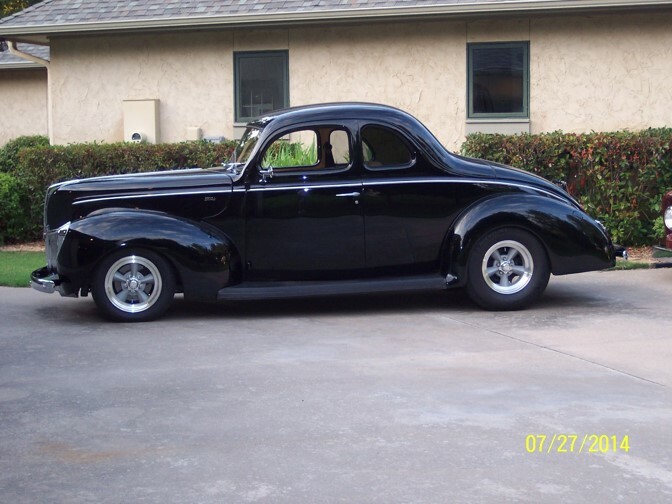 I own a 1941 Ford Coupe and was very seldom driving my car over the last couple of years. This was due to the amount of oil that would blow out of the breather and cover the engine compartment. 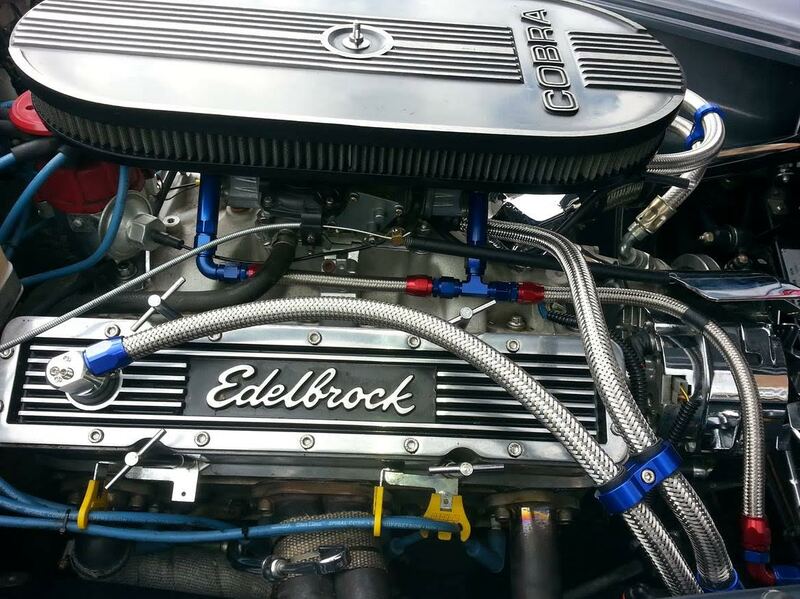 The engine is a 383 stroker with a big roller cam. I was ready to remove the engine and put in a different one, when I was told about a very special PCV valve, the M/E Wagner Adjustable PVC Valve. I was skeptical at first that a PCV valve could fix my oil problem, but after reading only good reviews decided to try this valve. Since I installed the M/E Wagner PCV Valve I have turned a car that was seldom driven into a daily driver! 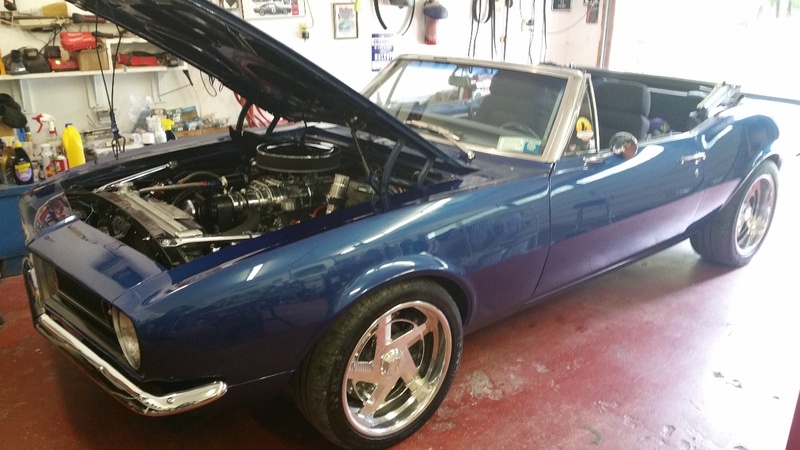 The engine compartment is no longer covered in oil and the car idles smoother. 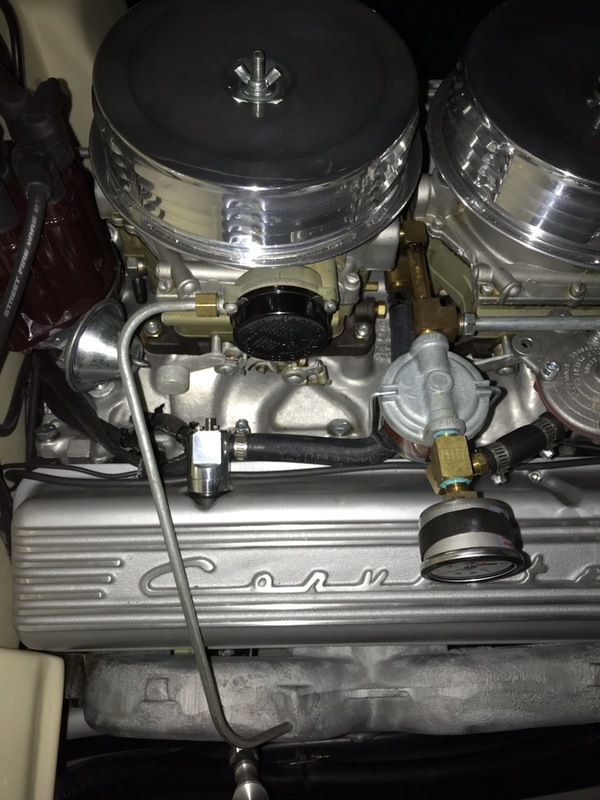 The M/E Wagner PCV valve has worked so well they are now on my other cars, 1969 Plymouth Roadrunner with a 512 stroker and 1956 Chevrolet Belair which I will be driving on the HotRod Power Tour 2016. 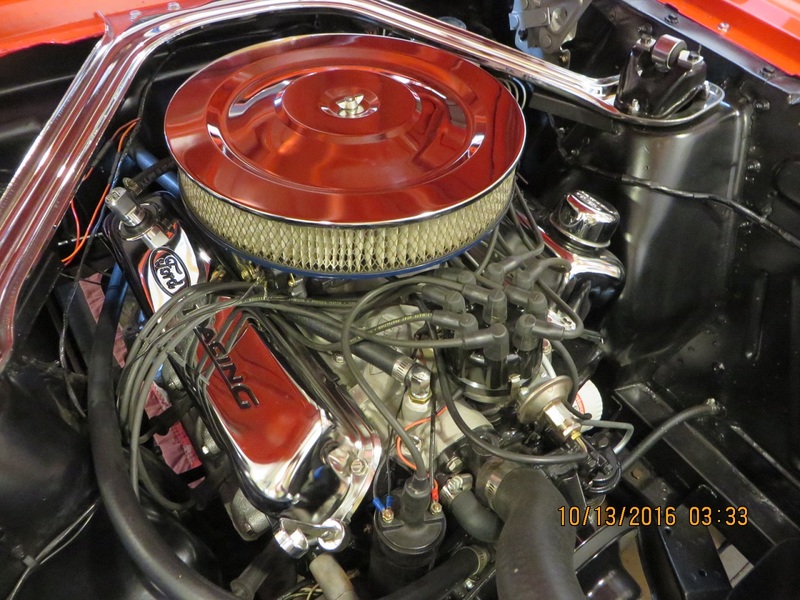 I installed my new M/E Wagner PCV October, 2015, on my 1959 Chevrolet 235 CI inline six in my 1951 Chevrolet Sport Coupe. I removed my standard PCV valve and installed the new PCV and tuned it in following the instructions. After installing, I went for a drive and immediately felt a very noticeable new surge of power as I left my driveway!!! WOW!! What a difference it made in my engine’s performance. It was well worth the extra cost!!! Oil stays clean and no oil consumption. LOVE IT!!! I feel sorry for those who don’t have one. They don’t know what they are missing. Thanks again for your invention. Love it. I set up the unit on my 455 per your instructions and find myself VERY happy with its operation to this point. 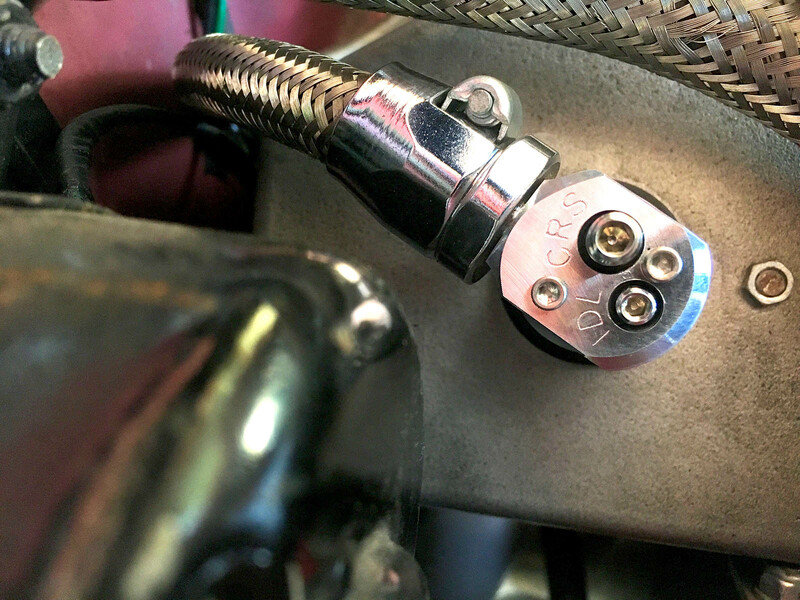 I was able to drop a size on my qjets idle tubes, drop a size on the primary circuit jets and I’d swear my Pontiacs normal slight rear main seal oil drip was better! 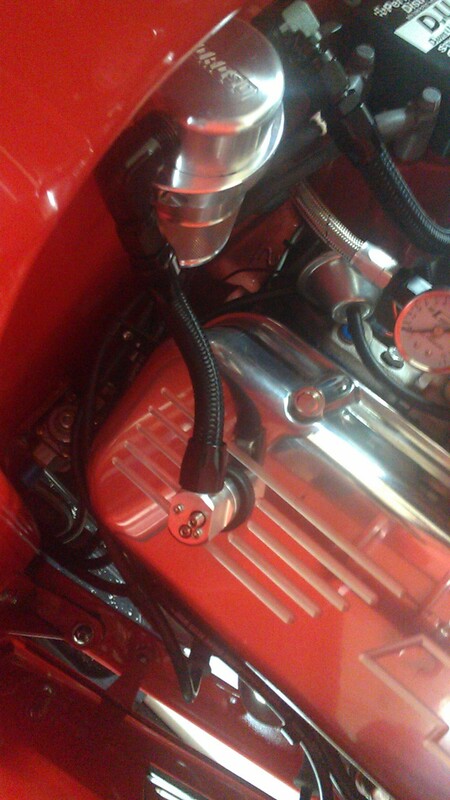 Where it installed on my engine even looks pretty good….that’s always a plus. Just wanted to say that I love your product and had actually forgotten about it because it’s been so reliable. And thank you for sending helpful emails and not spam. You have a solid product and I hope you continue to do well. 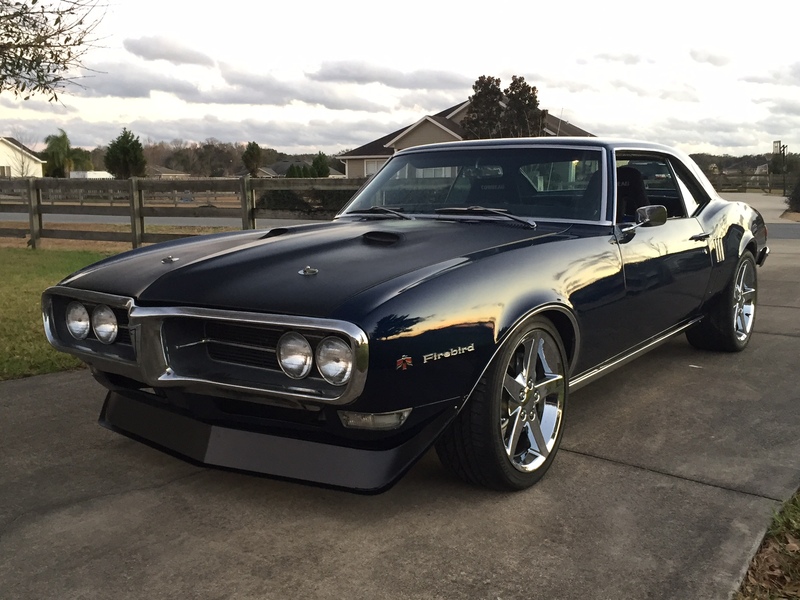 If you are not already aware, there is a forum with a lot of traffic for classic cars with the new trend of setting muscle cars up for road racing/autoX and street driving—Pro touring. I just posted hyping up your product from the perspective of a happy customer. Already had someone reply in detail that this is something the would buy but had not previously heard of. Here’s list of the AN hardware and hose I used and their PNs from your valve to the air/oil separator, then to the carb’s PCV vacuum inlet (usually 3/8” OD). I typically use Earl’s Performance stuff, which in my view seems better than the rest, yet with few exceptions doesn’t cost much, if any more. The Fragola and Russell lines are I believe are made offshore. 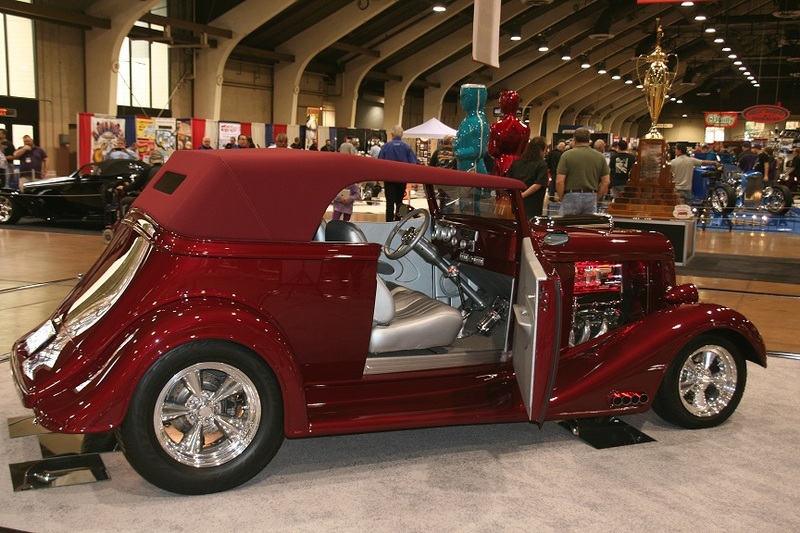 Aeroquip’s automotive line is ok, but doesn’t offer the variety Earl’s does. If a person wants black hose ends and adapters, Earl’s black “Ano-Tuff” costs more than Fragola and Russell black fittings. I used all black fittings on the roadster. 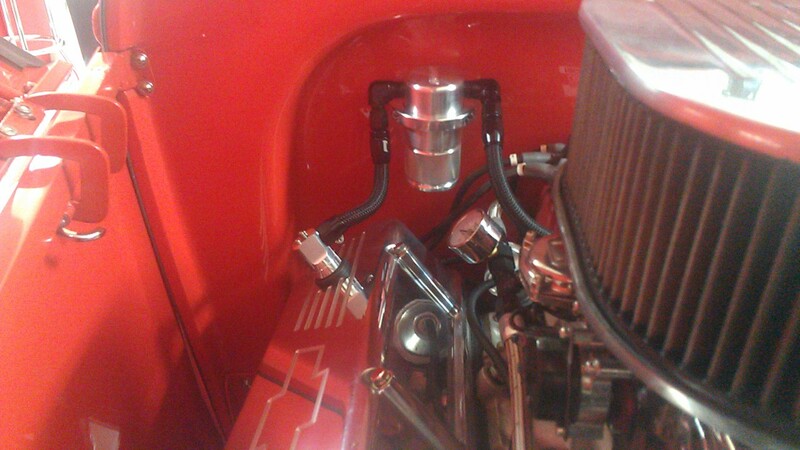 But on the ‘34, I used red and blue to match the existing fittings. 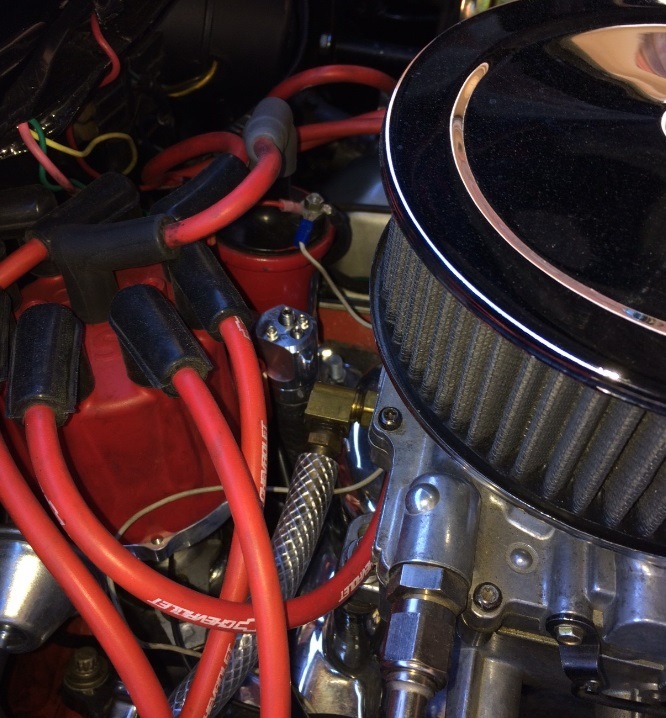 Starting with the hose, the following is a run down in order of assembly from your valve to the air/oil separator and on to the carb’s PCV vacuum inlet if the person wants to continue with AN hardware and hose. All hose is Earl’s Pro-Lite 350; wrapped in braided black nylon. Very flexible; 2.25” bend radius. 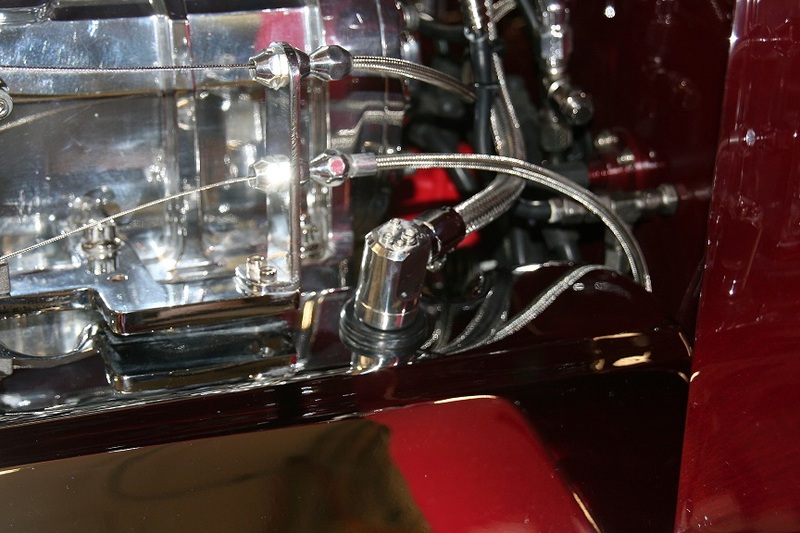 Will need to be reamed out a bit on the end that fits over your valve’s inlet and the carb inlet. I used a 3/8” mill cutter, but still a very tight fit on both inlets. 4. Male 3/8 NPT to male –6 AN aluminum adapter (comes in Straight, 45 and 90 degree). 90 degree: PN 982266ERL Which one will depend on where the valve is in relation to where the air/oil separator is mounted. I have just received the valve, and I had mentioned my purchase to a great friend. He was surprised at how much the unit cost, but today when I placed the valve in his hand he was just amazed. He is a highly qualified engineer, and he was just blown away by the pure quality of the product. I am sure within a month you will be shipping another unit to him. 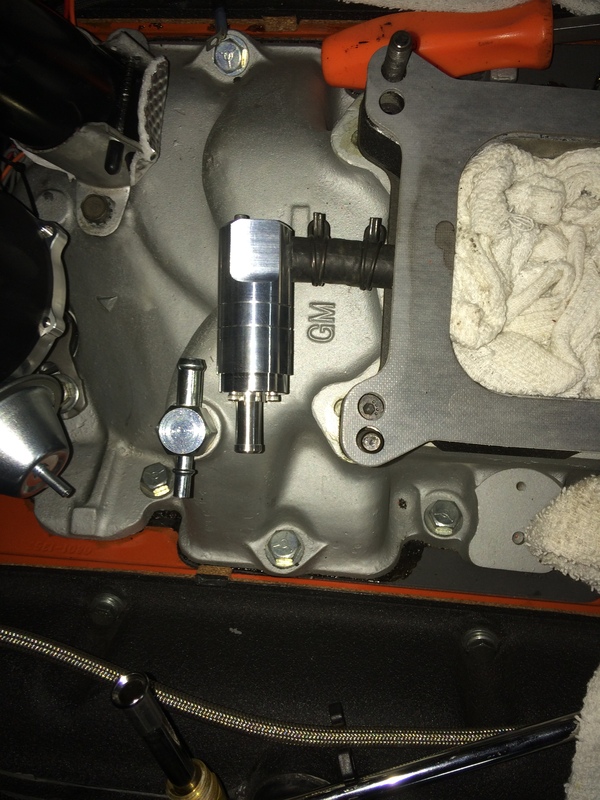 Click here to read Dave’s excellent writeup he did on his unique installation of our valve! 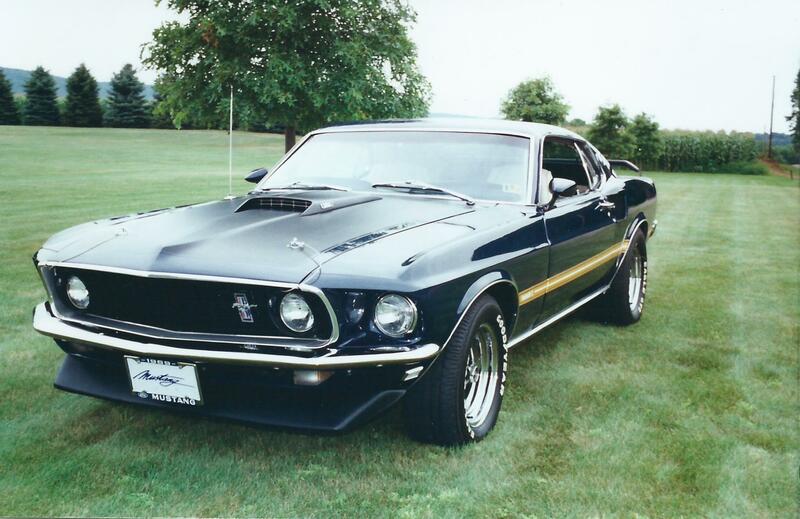 As the owner of a slightly modified 1969 Ford Mustang, and manager of an automotive shop, I had read about the Dual Flow PCV Valve. After receiving the valve, I was very impressed by both the quality of machine work and how easy it was to install and set up. 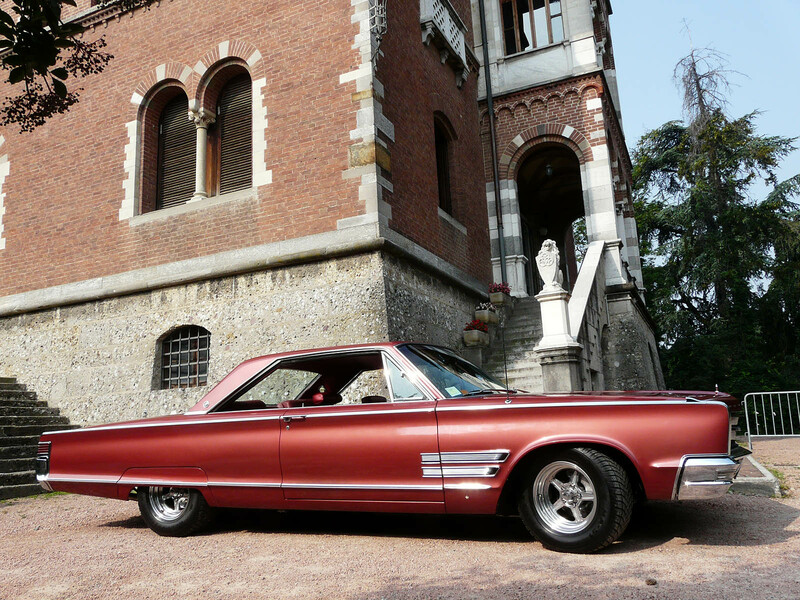 I am very happy how smooth the motor idles and how much better it drives. I would definitely recommend your product and will be installing it on all of my future project cars and trucks. Just wanted to tell you what an awesome product you make. 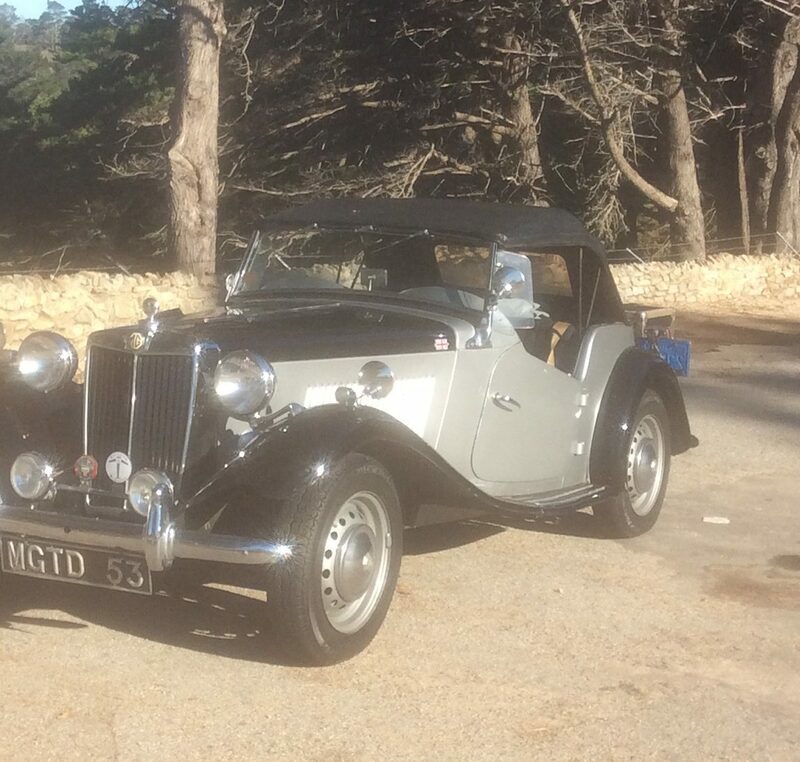 I just installed it on my 53 MG TD. At first I was apprehensive that it may not work with such a small (80 ci) engine, but it seems to have tuned in well. Here are a couple of photos, I am working on cleaning up the installation a bit. In the photo you can see I have run the line for the vacuum gage through the firewall so that the system can be fine tuned during driving. It is an amazing device, again I want to say how well made it is. I really appreciate the support…the info I’ve gotten from you was worth the price of the valve. I’ll certainly be recommending you to others. Before I found your site I read about a LOT of guys with similar issues with no really good solutions.